The finale episode titled “Dragonfly in Amber” would air on July 9, Saturday. The reason for this delay id the fourth of July holiday. TRPs are quite low during this period as the viewers tend to stay away from TVs due to the holiday. Almost all shows have taken a break this week. But to generate hype for the finale next weekend, the “Outlander” team has released a few plot points and spoilers to maintain the general interest of the show among the audience. As per the show makers, the ep is going to be epic as the episode would follow two story lines simultaneously, one with Claire in the future and other with Claire preparing for battle. The event would run for a 90-minute session. The executive producer of the show says that it would be an emotional ride to watch the show, and it’s almost heartbreaking. In the episode, we’d see Claire in 1968 with 2 new characters. One of those would be her 20-year-old daughter Brianna, and she would fall in love with the other one, named Roger. Claire would reveal to Brianna her history of time traveling days and Brianna’s true parentage. On the other hand, in the other plot of The Battle of Culloden, we would see how Jamie and Claire attempt to fight the Prince. 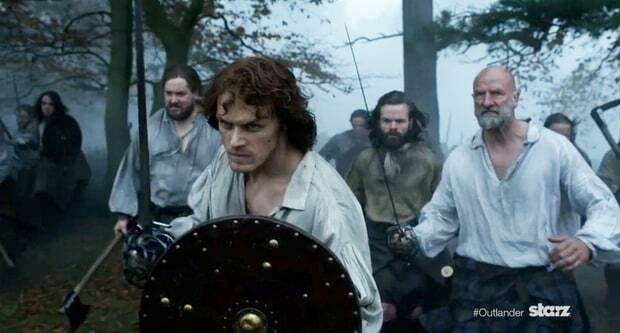 When Jamie’s plan to avert the battle fails, he and Claire device a plan which Dougal overhears and a deadly confrontation follow. The team has also hinted to a few deaths in the show. Apart from that, Jamie would have to bid adieu to a few of his loved ones to save them. And to make things more exciting, some of the favorite characters would be coming back. The war is going to be gruesome. So, loyalties would turn and falter, friendships would break, and people would divide. The producers are themselves very much excited to see audience’s reactions. We might not see the end of the war in this season. The team says the finale episode would just be the eve of the war, and the primary fight would not take place just as of yet. Guess they are saving some for the next season. The Outlander S2E13 will air on July 9. Stay tuned for more revelations. American Gods Season 2 Release Date: Is It A Hoax? What about Season 3?